This month we are celebrating genetics by providing you with great tools to use with your students in the classroom. Each week we will provide current events, fun facts, lesson plans, games and resources to help motivate your students. New scientific discoveries are made every day, increasing our understanding of even the most basic concepts. The phases a cell goes through during its lifetime is well documented, but until recently scientists could only determine the age of a cell after it died. Scientist at NYU made a n incredible breakthrough using a state-of-the art fluorescent microscope which allows them to see changes in the nucleus of living cells. Researchers observed small flickers of light emitted from the nuclear envelope. They discovered that young cells give off quick strong flickers, while old cells have fewer and weaker flickers. So, what’s all the fuss about??? With this new insight, researchers may better understand human biology. It is hopeful, that these new discoveries will help them to gain knowledge about healthy and diseased cells. Researchers believe that structural and functional errors in the nuclear envelope may be responsible for developmental and inherited disorders. Current events are a great way to introduce the “why we care about this topic” to students. As you begin to cover topics such as the phases of the cell cycle, recent news articles like this one can be used to get students thinking about why the science is important and how it may benefit them. You can link to the full proceedings from the National Academy of Sciences of the United States of America to learn more about this new discovery. 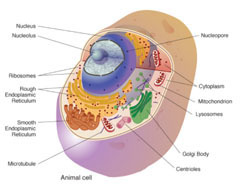 Genetics Home Reference – What is a Cell? 99% of your genome is exactly the same as the person next to you. If you could uncoil all of the DNA in your body and lay it end to end it would measure 10 billion miles – the distance from Earth to Pluto and back! 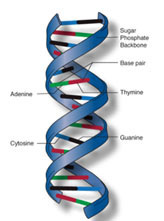 DNA has the potential to store more digital data than your cell phone. One ounce of DNA could fit on a penny, store 300,000 terabytes (300 million Gigabytes) of memory and accessible for up to a million years. This service is provided to you at no charge by K-12 Science and Health Education.